Promise Technology on Thursday announced two new external storage solutions featuring high-speed Thunderbolt 2 connectivity —the first drives of their kind to hit the market. 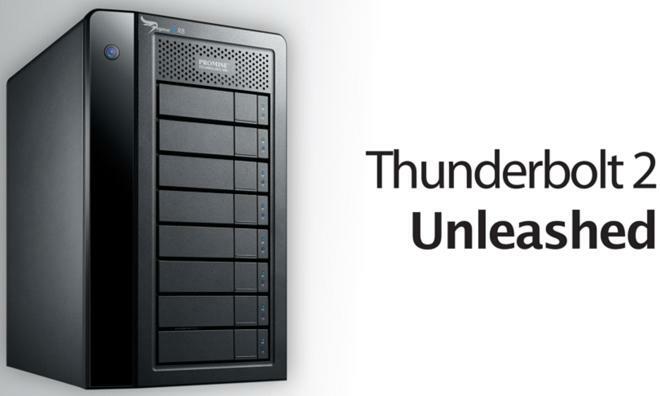 Promise's new Pegasus2 RAID storage solution with Thunderbolt 2. The new Pegasus2 and SANLink 2 lineups both offer 20Gbps connectivity thanks to Thunderbolt 2, which is supported by Apple's most recent Macs. Promise said its Pegasus2 line of RAID storage solutions can accelerate and simplify 4K workflows. And the SANLink 2, featuring a Thunderbolt 2 to 8G Fibre Channel bridge, can ease storage bottlenecks for both desktops and portable systems. The Pegasus2 comes in sizes ranging between 8 terabytes and 32 terabytes. It will launch in Apple's online store and other resellers in November, while the SANLink 2 is scheduled to arrive in December —the same month Apple's new Mac Pro desktop will arrive. Promise's new SANLink 2 with Thunderbolt 2. "SANLink2 and Pegasus2 have set new standards for performance and flexibility, creating a whole new realm of possibilities for multimedia pros and power users," said James Lee, CEO of Promise Technology. Being the first company to bring to market storage solutions with Thunderbolt 2 technology further validates Promise's position as the leader in designing high-performance devices for the media and entertainment market —which revolutionizes the creative workflows of our customers so they can be ready for creating, editing, and delivering HD and 4K and beyond content." Thunderbolt 2 runs bi-directionally at 20Gbps, doubling the bandwidth of the original Thunderbolt port and its accessories. The Pegasus2 RAID storage solutions come in 4- 6-, and 8-bay enclosures, and feature two Thunderbolt 2 ports, allowing up to 6 devices to be attached, daisy chaining up to 6 Pegasus enclosure units, Thunderbolt Displays, or mini DisplayPort devices. In addition to its dual 8Gbps Fibre Channel ports, the SANLink2 has dual Thunderbolt 2 ports and can be used to connect Thunderbolt 2 systems directly to a high-speed Fibre Channel SAN, such as the Promise VTrak x10 or x30 RAID storage systems, or a VTrak A-Class shared SAN storage appliance.